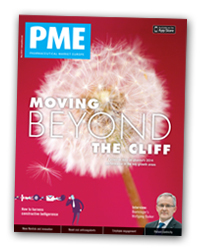 The May issue of PME looks at an award-winning and innovative project by Novo Nordisk to improve patient outcomes. Staying with the patient, we ask how far should the industry go in setting a patient-centric agenda? We also speak with Boehringer Ingelheim’s Dr Wolfgang Baiker about the company’s ambitious plans in biosimilars and how it hopes to forge ahead in the area without upsetting its existing contract manufacturing business. The new generation of novel oral anticoagulants gets put under the microscrope, and we find that, while they may be a cost-effective choice, access remains an issue. We also hear from AbbVie and others about how the pharma industry could meeting the challenge of system redesign. As well as this, the May issue has the latest in the Heart of the Matter thought leadership series from McCann Complete Medical and PME’s Digital Doctors supplement.